Picture by Jonathan Porter, Press Eye. ONE of Northern Ireland’s most senior forensic psychiatrists has called for a residential prison healthcare wing to be re-opened after a study found mentally unwell prisoners were physically isolated from other inmates while waiting to be transferred to a specialist hospital. Consultant forensic psychiatrist Dr Adrian East told The Detail he believes there is now clear evidence that the closure of the residential healthcare unit at Maghaberry Prison means some mentally unwell prisoners are being “managed” in the Northern Ireland Prison Service’s Care and Supervision Units (CSU) where they are segregated from the general prison population. Dr East specialises in the assessment and management of mentally unwell offenders and works closely with the Belfast community-based Shannon Clinic Regional Secure Unit which is a purpose-built 34-bed inpatient facility specialising in treating people who are mentally unwell. Dr East’s comments follow the publication earlier this month of the first audit of Northern Ireland’s forensic mental health services which found 10 referrals were accepted by the Shannon Clinic from the Care and Supervision Units (CSU) during the three-year period from 2014 to 2016, compared to no referrals from the CSU from 2010 to 2013 when the healthcare wing was still available. Out of the 31 referrals made to the Shannon Clinic from 2014 to 2016, 21 were from ‘normal locations’ within the prisons, such as landings. This is compared to the four years previous from 2010 to 2013 when 16 of the 50 referrals to the Shannon Clinic came from ‘normal locations’, although there were more referrals overall. 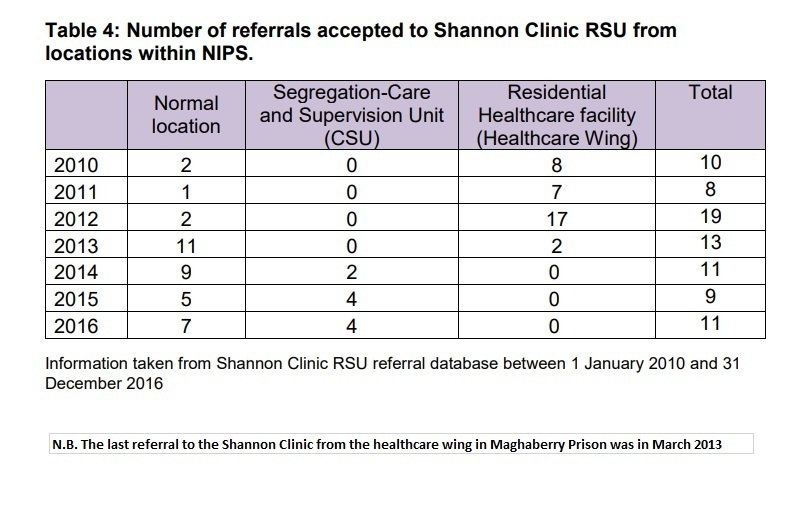 Thirty-four of the referrals from 2010 to 2013 came from the residential healthcare wing, the last one being accepted in March 2013 due to the closure of this unit at Maghaberry Prison. The CSU has been referred to as an area of the prison where prisoners are placed in ‘solitary confinement’ however the South Eastern Health and Social Care Trust (SEHSCT) told The Detail that inmates in the units “are not subject to solitary confinement but are facilitated with time out of cell/the unit as appropriate and all are supported by the healthcare team”. The SEHSCT took over responsibility for prison healthcare from the Northern Ireland Prison Service in 2008. It described the CSU as a unit “within a prison [which] is a separate residential landing where the prisoners held have restricted association with other prisoners and limited access to the generally available facilities within the prison”. The audit report, dated August 2018 and which was published by the health and social care regulator the Regional Quality Improvement Authority (RQIA), recommended further assessment to establish whether there is a need for a residential health facility at Maghaberry. 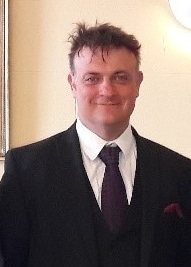 The SEHSCT told The Detail there is currently no-one in prison awaiting transfer to an external mental health facility, and added: “People in prison with mental health needs are not segregated from the wider prison population, they are held within normal accommodation and provided with a range of supports from both the prison service and the trust’s healthcare teams. The trust stressed that the former residential healthcare wing at Maghaberry was not specifically a mental health facility. The audit focused on Maghaberry and Hydebank Wood Prisons, community forensic mental health teams, the Shannon Clinic Regional Secure Unit and the Six Mile Unit at Muckamore Abbey Hospital in Antrim - which it described as a low secure forensic unit for men with a learning disability who are in contact with the criminal justice system. No data was available on the number of referrals made by the prison service to the Six Mile Unit at the time of the audit. Dr East said there may be occasions when an inmate needs to be isolated for the safety of other prisoners and staff but this must be a last resort. Dr East was also critical of the decision to close the residential healthcare unit at Maghaberry. The Detail asked the Northern Ireland Prison Service and the South Eastern Health and Social Care Trust why mentally unwell prisoners were being kept in the CSU and if there are any plans to re-open the residential healthcare facility at Maghaberry. The prison service declined to comment and said it was an issue for the trust to provide a statement on. The South Eastern Health and Social Care Trust said all prisoners undergo a health assessment on committal which includes a screening to identify any mental health issues. The spokeswoman added: “There is a multi-disciplinary mental health team based within each prison which is inclusive of consultant forensic psychiatrist, psychiatry doctors, mental health nurses and occupational therapists. The forensic mental health and learning disability services audit noted that, before the Shannon Clinic opened in 2005, there was no specialist inpatient mental health facility in Northern Ireland. The Shannon Clinic has three wards and treats both men and women. Referrals are primarily received from high secure hospitals, courts, prisons, psychiatric intensive care units and community forensic mental health teams. The Six Mile Unit, which opened in 2006, consists of a four-bed assessment unit and a 15-bed treatment unit. Dr East is the principal author of a new report on prison mental health in Northern Ireland which is expected to be published by the Royal College of Psychiatrists in Northern Ireland later this week. 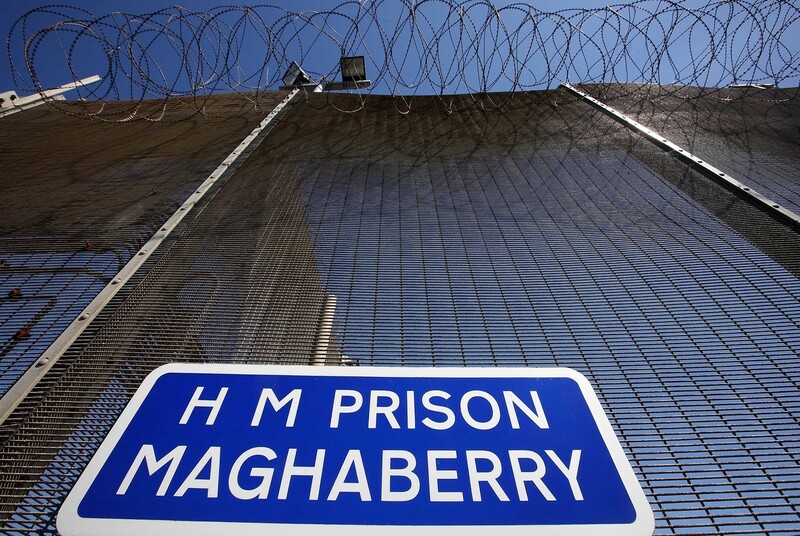 The Detail previously found some prisoners were held in solitary confinement for months and even years in Northern Ireland’s top security Maghaberry Prison – despite a call from United Nations’ inspectors for a worldwide ban on more than 15 days. See full story here. Last month prisons expert Emeritus Professor Phil Scraton called for an independent inquiry into mental ill-health, self-harm and deaths in Northern Ireland’s prisons. Read more here.